We are thrilled to tell you about an amazing project we worked on. Built by Guild and designed by Architecture Architecture ‘The Kite’ has been successful this year at the Victorian Architecture Awards 2018. Click here to read about the design features of this sublime home. The kite house is a one-off kitchen in a unique house full of open space and angles and nestled amongst beautiful silver birch trees and lush gardens. Entering the kitchen, you get a sense of sleek minimalistic beauty which flows directly into the courtyard. The kitchen is a mixture of many materials and textures including laminate, solid Victorian Ash timber, stainless steel, Corian and powder coated black steel. Blum products were used for all internal hardware and drawer systems. One of the many exceptional features of this kitchen is the black Corian encasing the stainless-steel cupboards and appliances. 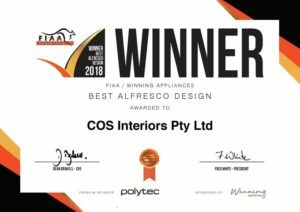 COS Interiors took part in the annual Cabinet Maker & Designers Association (CMDA) Awards for 2017. The CMDA Awards were held at the Members Dining Room at the MCG in Melbourne. We thoroughly enjoyed the evening, especially with our MC host Brian Nankervis from Rockwiz and live entertainment throughout the night.